Today was the Tuesday Downtown market--I didn't make it. I'm sad to say that I've not been to the Tuesday market all season especially given the fact that it's about a 5 minute walk from home. Tomorrow is Wednesday and there are several farmers' market choices in the Syracuse area There's the new market at Shoppingtown Mall in Dewitt--open from 10-2pm. If you miss that one, you can catch the farmers' market at Green Hills Market over in the Valley. And if you're near the Westcott neighborhood you can catch the Loguen Park market on East Genesee Street. Thursday brings the Skaneateles farmers' market, Friday is a rest day and then Saturday offers the big CNY Regional Market, the Ithaca Farmers' Market, the Greener Bean organic market in Skaneateles, and for those back east--there's the Cazenovia and Hamilton markets. We have a lot of markets and this is a good thing. The thing is...we Central NY is still a place where folks will walk past good, local, affordable produce being sold by the farmers who grew it--to get to shipped in produce being sold in the grocery store. Several of our markets are located quite intentioally in supermarket parking lots (to make it easy for errand-running) but many folks never even stop and look at the incredible produce being sold. Others come week after week and never make a purchase. What's up with that? Really. Michael Pollan makes the point that cooking has become a spectator sport--who needs to buy produce if one doesn't plan to cook it up? We have lots of markets, but I fear that they can't be sustained if more people aren't shopping them. Like me, many of you already support these markets--on top of subscribing to a CSA share AND growing your own. There's only so much one can do. I'm used to preaching to the choir for my day job, so I won't do that here. I just hope we can get more of our neighbors to support the small markets that are doing everything they can to put delicious food on our tables. I don't want us to begin losing markets or farmers because they couldn't make it. 1. There are too many fun things going on this weekend. 2. You have to eat. To wit: there's the downtown Arts and Crafs Fair, the new Northeast Jazz and Wine Festival, the Ecofest, the Oswego Harborfest... plus there are chores to do, errands to run, the regular weekend gamut. Okay, its ambitious. But I guarantee at least four of the items will be checked off by day's end and what will make it possible is dinner. I am absolutely loving this recipe for sticky balsamic spareribs published in Gourmet magazine last month (and for the record, I do read and cook from other magazines--it's just that Gourmet has been on fire as of late.) Check out the play by play after the jump. I've got some vacation time coming--yay!! !--which means I'll be getting out of town for a few days. I'm off to bop around the Hudson Valley. While I"m really looking forward to basking in the beautiful landscape on the banks of that great river and to exploring its culinary hot spots, I'm actually going to miss the 'Cuse. Especially this weekend. So if you are sticking around, go check out all the fun stuff I'm going to miss. And tell me all about it in the comments! I'm so glad to see that Syracuse University and SUNY-ESF and keeping these going. Vendors include Abdo's Garden Market, Belle Terre Farm, Creekside Meadows Farm, Hafner's and Monarch Farm. Also committed are Butternut Pottery, Carvel Ice Cream, CSA of CNY, ESF, Ma & Pa's Kettle Corn, Marcy Linsner Jewelry, SpaZend Day Spa, Spud Shack, Sweetrees MapleProducts, Syracuse Soapworks and Watson Greenhouse. And this won't be the last one. More markets are scheduled for the Waverly Lot (where it has been held previously) on these dates: Sept. 11, 18 and 25 and Oct. 2 and 9--mark your calendars! This organic market, held in the parking lot of the P&C opens Saturday (this gives Skaneateles an option in addition to the Thursday market). 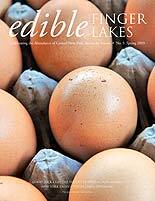 It features Harvest Home Organics produce and other local farmers and producers. Strawberry Picking Opening Day at Cobblestone Valley Farm in Preble. 8am - 4pm. According to the latest info, strawberry fields aren't forever--they may even be somewhat limited at this point in the season due to farm logistics and weather. They expect the season to be slower and longer but Saturday will be your chance to get the first pickings. Keep checking their website for the most up-to-date information. Have a great weekend and don't forget to drop a comment and let us know how you spent it! If the stock market was as exciting as the Regional Market these days the economy would be on a definite upswing. If you want to talk investments and returns in a way that brings immediate satisfaction, then you have to check out the CNY Regional Market as it begins to ramp up for the spring season. Investing with these local farmers and producers will only bring the best returns. The biscotti from the Rock Hill Bakehouse Bakery are not to be missed. I first sampled some of their lemon pistachio but have now fallen head over heels for their chocolate almond biscotti. We're talking chunks of dark Belgian chocolate and whole almonds--it is some of the best I've ever had. Ever. Oh, and don't forget the bread. Large, European-style loaves in about a dozen varieties. Special loaves are available by calling a few days in advance for pick up at the Saturday market. Rock Hill is pretty well known down in NYC where they sell at the Union Square Greenmarket, among other places. I'm so glad to welcome there here. Now if you want to do some baking but want someone else to do some of the prep for you, you might want to check out Organically Hip. Maria and Angela have been at this for a little while but have recently debuted new packaging that practically jumped out at me. They produce a range of baking mixes to whip up your own pancakes, cookies, and waffles. And their oatmeal, granola, and trail mixes come in large bags and smaller single-serving bags that are perfect for travel--I'm loving the coconut raisin granola. Organically Hip seems to be all about health and deliciousness--they even offer gluten-free products. You can pick up some of their home-made vanilla extract (check for the vanilla bean in the bottle) to use in your baking. And if baking is too much, their par-baked pizza shells are all ready to go--just add toppings and bake. All this and they try to support local farmers too! And if you're needing some milk to go along with those cookies...Meg at Wake Robin Farm says the "girls are milking". Their luscious, Jersey milk is now at the market (as well as the Syracuse Real Food Co-op). Now I know spring is here! I am finally coming up for air after the holidays, moving into a new residence, and writing nonstop for the other parts of my life--thanks for hanging around during my hiatus! Watching the increase in demand for locally grown and produced food in the Syracuse area was an amazing thing to see. In the year 2008 we nearly doubled the number of options for shopping at farmers' markets and subscribing to community supported agriculture programs. New markets like the one at Green Hills Market in the Valley, the organic market in Skaneateles, and the second year of the market at Loguen Park meant that one could obtain fresh, local food almost everyday of the week. Add the new CSAs distributing in Syracuse like Wyllie Fox Farm and Common Thread Community Farm and you can see the beginnings of what I hope will be a deep and lasting alternative food system for our area. If there is anything Syracuse has in abundance it is grassroots energy. The near simultaneous development of Syracuse Grows and a local Slow Food chapter have fired up our community for action while providing lots of ways to get involved in creating a just and sustainable food system. From their mission statement: Syracuse Grows is a grassroots network cultivating a just foodscape in the city of Syracuse. We provide programming resources and education to grow equitable local food production, distribution and consumption through urban agriculture and community gardening. They meet the second Tuesday of the month at the Cornell Cooperative Extension. Check out what they've been up to here. Slow Food CNY had a record turn out at its last meeting and it is so exciting to see how much enthusiasm they've generated in the community. I've posted about Slow Food events on this blog in the past but these events were not hosted by our local convivum (chapter) because we didn't have one. Now we do and they are working with Syracuse Grows and other area groups to support the preservation of our local foodways and to encourage the pleasures of the table. And they'll advocate for sustainabiity along the way. Check out their blog here. Talk about slow--I just discovered this place--the day before it closed for the season back in October. I'm always looking for good, authentic Mexixan food and this place is the real deal. It is definitely worth the drive to Marcellus to pick up a burrito with all the fixings prepared fresh--no cans of premade salsa here--you can watch them prepare right in front of you. I'll post more about Boom Boom when they reopen in the spring. This meal really needs its own post--perhaps I'll get to that eventually. But let these words suffice: Chocolate bacon tart. For dessert. It was an incredible way to top off an amazing tasting menu put together on the fly by chef Michael Anthony at Gramercy Tavern. And yes, this is about Central New York because Michael Anthony grew up here--went to Camillus High and everything. It was a meal to remember but what made it so great in addition to the food, was conversation with Michael in between courses. He's a true advocate for local, seasonal food and when he gets in the kitchen, he really knows how to make magic happen from simple ingredients--house made pasta, house made sausages--nothing is wasted. He's my hero and I can't wait to get back there. Not a food or farm experience per se, but the election of now President Barack Obama means, among other things, that the "can do" spirit and creative imagining can live once again in the hearts of the people of this country. There will be changes in our country--some of them will be immediate and others will be slow to come but there is a sense of optimism and hope that will no doubt permeate the world of food, food justice, and sustainable food production so that even in a time of financial difficulty. And personally, it meant more than I thought I knew to finally see a person of color take the oath of office for President. What a time to be alive. Here's to 2009 and all of the delicousness that awaits! At this time of the year it can be hard to tell which way the season is going to go by the weather. Today felt like a beautiful spring day while this past weekend had me prepping for winter. I'm not all that inclined to rush the season along but the earlier sunsets and the raking of leaves tell me that there is no turning back. I, however, will do what I can to put it off. Instead of putting my garden to my bed, I tuck my tomatoes in at night to extend the harvest. Each night that there is danger of frost I cover the volunteer paste tomatoes growing in the middle of the back yard (where last year's tomato patch had been) with an old bath towel. In the morning, I wake up, remove the towel and hope for sun and high temps. I cling to hopes of being able to jar a bit more sauce for the winter. Other signs that the season is winding down...tomorrow is the last of the four farmers' markets held on the Syracuse University campus. The last two were on days with tropical storm like weather. Tomorrow promises to be beautiful so come check out the the fall harvest and get your squashes, root vegetables, and other storage produce to hold you over the coming colder months. I'll be there from 11:00 - 1:00 pm signing copies of the book I contributed to: Bread, Body, Spirit: Finding the Sacred in Food. 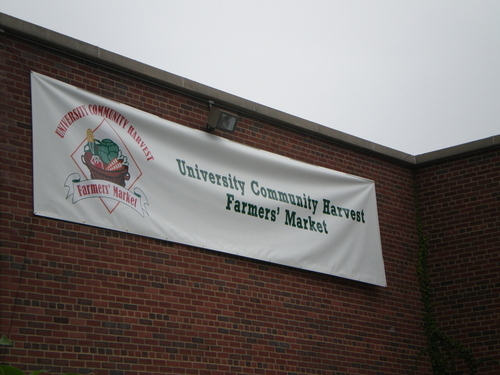 The University Community Harvest Farmers' Market takes place in the Waverly parking lot from 10:00 am to 3:00 pm. 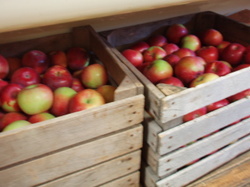 Lastly, lovers of all things apple shouldn't miss the annual Lafayette Apple Festival taking place this weekend. Local apples, cider, the crunch of leaves underfoot, and yeah, I know, crowds. But it's autumn perfection. Enjoy every moment. 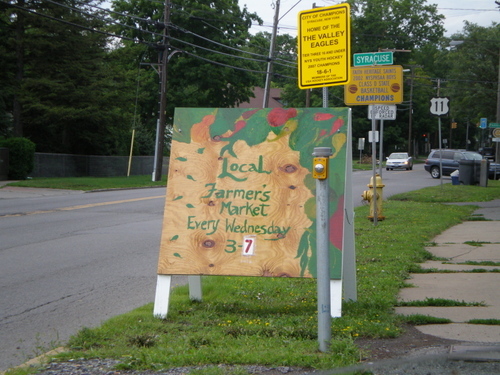 Small, neighborhood farmers' markets seem to be popping up all over Syracuse. Now the Valley and the South Side have a delicious option too. Check out the market held in the Green Hills parking lot on South Salina on Wednesdays from 3-7pm--it is small but mighty. Organic vegetables and herbs, pasture-raised meats, Heamour Farms cheeses and Navarino Orchards selling their delicious pies are selling well so if you aren't already on your way today--put it on the calendar for next week. For my part, I found that a blueberry pie from Navarino and a pint of Mercer's wine ice cream picked up at Green Hills makes this market stop irresistible.